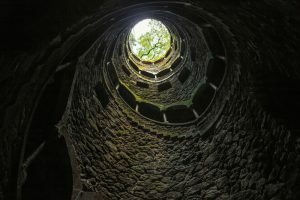 How to Extract Yourself From the Scarcity Trap - LifeLong EnerJoy! Many people think that poor people are poor because of their inability to make responsible decisions about money. While this is usually true, it is not necessarily because of something inherently wrong with their brains. In fact there is evidence to show that it is the lack of money that causes people to make worse decisions about their money! To study this, scientists couldn’t ethically take a group of people and make them poor over a long period of time. However, they found a natural experiment that already happens regularly to sugar cane farmers in India. These sugar cane farmers get paid once a year. At the end of the year, before the harvest, they are often struggling financially. Then after payday, they have more than they need. Researchers from Princeton and Harvard gave cognitive tests to the farmers 2 months before and 2 months after harvest, and they performed an equivalent of 10 IQ points lower before the harvest than after. The farmers when poor were not able to think as clearly as when they had the money they needed. Their decisions were made more from a place of desperation, and they didn’t have the bandwidth to see the big picture. Barbara Ehrenreich is a reporter who decided to see if she could survive on minimum wage jobs in America. 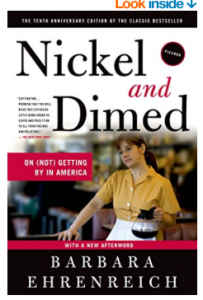 She writes about how hard it is to get out of the poverty trap in her book Nickel and Dimed: On (Not) Getting By in America. She gives plenty of examples of the decisions poor people are confronted with that keep them in the poverty cycle. The researchers from Princeton and Harvard look at scarcity in the context of time as well. They had Princeton students play a jeopardy like game where they were given a lot of time, or very little time to answer questions. Half the students who got only a little time, were given options to borrow time at a high penalty. The students who borrowed time ended up making less in the game than the students who were time-poor, but didn’t have that option. Again, scarcity, this time in terms of time, forced these students to make bad decisions. Scarcity can impact our behavior in other arenas as well. Profound loneliness makes us more desperate, and that desperation can scare potential friends off. My client Mary said that when she was consumed with the idea that she had no one, that she would forget to go to the things she had been invited to! Loneliness, or the belief that no one would be there for us, can inhibit us from reaching out to others and checking in. And the more we withdraw from friends, the more likely we are to lose them. It is a viscous cycle! Scarcity influences the behaviors and outcomes of addicts as well. Drug addicts who live in countries where drugs are illegal will spend their whole day doing what they can to get their next fix. They can become so desperate that they might steal or engage in petty crimes to meet their needs. Addicts in countries that have methodone clinics or safe injection sites don’t need to worry about getting their high. They can thus focus on their career, paying bills, and getting healthy. Because they have the bandwidth to focus on taking care of themselves, they cost their countries a lot less, and their needs to escape their reality (by using drugs) decreases substantially. It is a lot easier for someone to quit an addiction when they have something to live for. So why does scarcity change the way we think? A big part of the problem with being in the scarcity tunnel is that we often can’t see when we are in it. So now that you know that scarcity affects your brain’s ability to get out of the trap, what should we do? It is very tough to get out of the scarcity trap by yourself. You have to find a way to broaden your mind, and to do that you have to do something drastically different to shift you out of your mindset. If you are lacking money, working with a money coach can help. If you are lacking time, you need to find a way to make more time for yourself. And if you are feeling alone, you have to find a way to allow people in. Regardless of what the scarcity is, the best way to get out of the trap is to let go of your negative beliefs and embrace an abundant mindset. Is changing your mindset enough? Yes! Remember Nancy? She worked with me to release her negative beliefs about her ability to attract and keep good things in her life. Since doing this work she has seen profound differences in the number and quality of people she attracts and her ability to bring in business! She had been feeling lonely for year, and after doing this work, she feels like she is easily attracting new friends and connections into her life! She had been looking for a new employee for a month, and after doing this work, her inquiries from good candidates accelerated rapidly, and she found someone within a week! Plus she made as much money in the following week as she had all month! 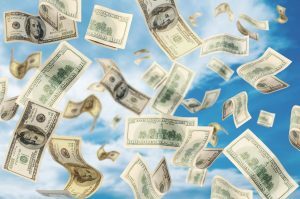 Releasing barriers to abundance works! You can read more examples of how changing your mindset changes your abundance in my articles below. Want a quick assessment of your abundance and how aligned you are with your goals? You can set up a 20 min complimentary consultation here. Please use the share buttons below to share it with friends! From Poverty to Abundance with the Body Code.